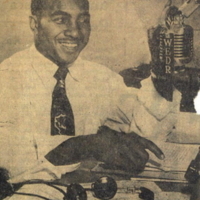 Ben Alexander (b. Sept, 1927), an early arrival at WEDR 1220 AM, Birmingham, Ben spent from the end of 1949 to October of 1950 at the station and recalls personnel and personalities of the time. He became a Lt. Colonel in the army and retired to Richmond, Virginia where he did both print and audio commercial work. Bob Friedman- We had a woman who came in with a copy of the Birmingham Weekly Review, which was a large size, it was like a Birmingham News, Atlanta Constitution Sized Newspaper. 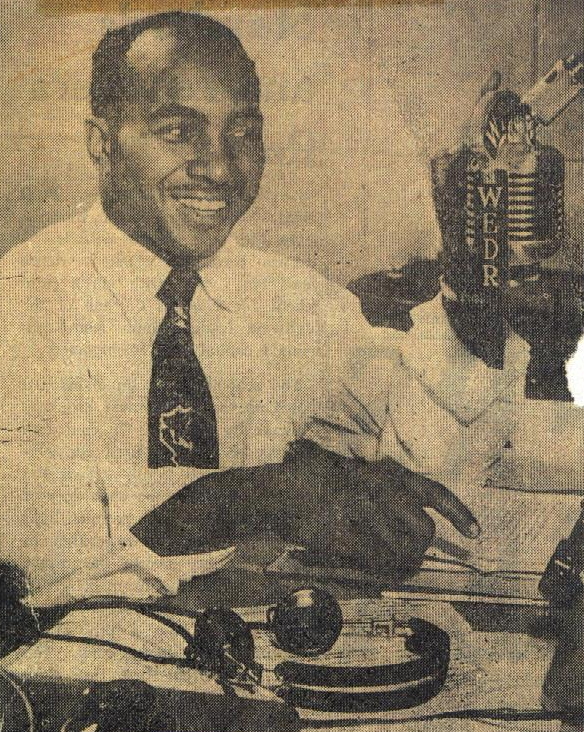 BF- Black Republican looking Newspaper and had, it had whole spread on WBCO she didn’t even know that her mother, she she was at BCO in 1952 her name was Lora Gary. BF- Became Lora.. actually she was Lora walker and then joined our staff in ‘54 or ’55 and changed her name, got married. But any way, her mother had saved this thing and had laminated it. It was all yellow but she..
BF- But she had laminated it so it lived through the years. BF- And it’s just extraordinary to read, you know, the Dominoes came down to visit and all. It’s like..
BF- Great , great stuff. Great stuff. BA- Yeah, we, we we interviewed uh you know Jackie Robinson, uh uh what’s… I was just thinking about him the other day because there’s uh this other guy that who’s name I’m trying to think about now, but because there’s a play starting here in Virginia about him. Um Louis Jordan. BA- And uh, we interviewed him, there were uh you know, Count Basie, Lucky Millinder was a band leader that came there, uh Duke Ellington. They all came and paid a visit to WEDR, whenever they were in town. All, all of the performers came in. BF- Do you remember anything distinctive about that year besides the bombing of the, well they blew up tower or the transmitter? BA- It was the transmitter. BA- Not the transmitter.. no sorry the tower. Tower. BF- tower came down. Yeah. Yeah. BA- But after that I think things sort of cooled down and..
BF- well supposedly in 1958 or so uh somebody had scrawled KKK on the walls of WEDR. And there was a picture of another jock named Shelley Stewart, I don’t know if you’ve ever heard of him. BA- Yeah that was after my time. Yeah. 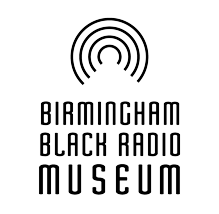 Bob Friedman and Ben Alexander, “Ben Alexander, Oral History,” The Birmingham Black Radio Museum, accessed April 21, 2019, http://thebbrm.org/item/16.